Ostriches have a unique nesting strategy that serves them well as flightless birds in the African savannahs and sub-Sahara. Several females put their eggs in a single nest. 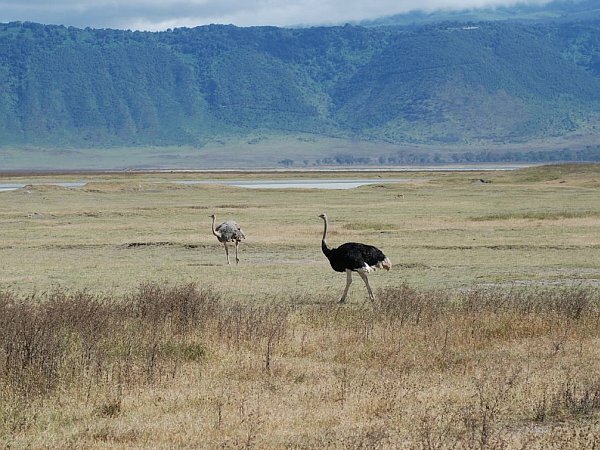 At six to nine feet tall and 140 to 300 pounds ostriches cannot fly, so for safety during the breeding season they live in flocks of five to fifty birds. When danger threatens they run or hide or kick the enemy with their feet. Running is good but how do they protect their ground-based nests? Eggs can’t run. Rather than protecting many scattered nests they organize into harems and all the females lay their eggs in the same scrape. The dominant male mates with all the females and the dominant female incubates the eggs. Sometimes there are too many eggs for her to sit on so she rejects the extras — laid by the minor females — and sits on only 20-25 eggs. During incubation the birds hide the ground-based nest. The female’s brown feathers match the daytime landscape, the male’s black feathers are hard to see at night, so the female incubates during the day and the male at night. To further hide the nest they lay their heads and necks on the ground so they look like a lump. Daytime heat shimmers hide the female in a mirage! Here you can see their how colors provide camouflage in their open habitat. 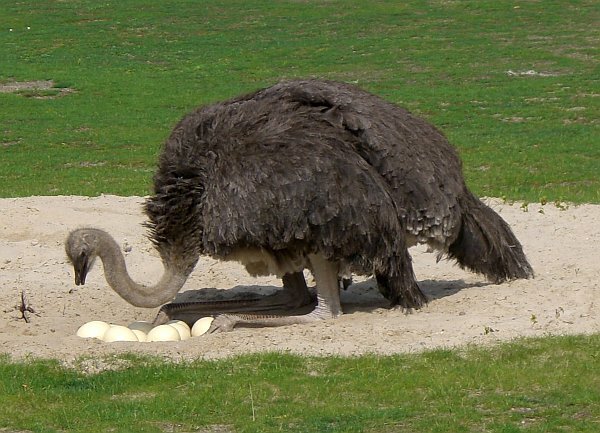 The moral of the story for an ostrich is: If you keep your head down you can put all your eggs in one basket. NOTE: The nest photo was taken at a German zoo in a setting much greener than an ostrich usually inhabits. Flopping down & laying their head/neck on the ground to hide = origin of the “head in the sand” myth? Actually, Wiki says that Pliny the Elder started that myth. Wow, how’d Pliny know that? Ostrich mind-reader? If you put all in your basket, you should watch that basket very intently.